An outing on the Upper D this past weekend was pretty much a bust. You might as well write off the West Branch for the rest of the year. It is running very dirty. 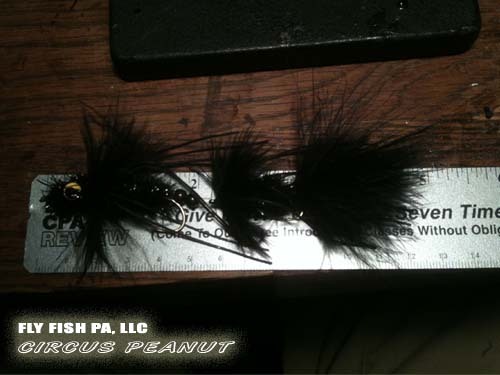 Over the course of a day of floating we moved three fish on Russ Maddin's circus peanut - fished very tight to the bank. However, no love from the trout. No solid hook-ups. The bug scene on the West Branch was non-existent unless you count the handful of october caddis that were out and about after dark. 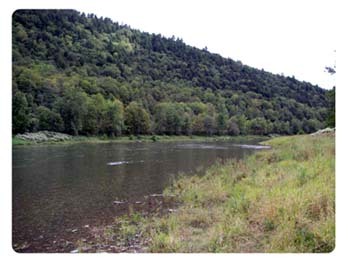 In order to find fishable water, roll downstream below Lordville. In the evening hours we did find bugs. Isos were in the air. Both dun and spinner state. The fish were not keyed in on them. That said, a hi-stick fished rig of a variegated stone and a prince nymph did stick some bows. You really had to put in your time though, and pound the rocks. Visibility was limited so you had to put the rig right on their nose. The fish are definitely down in the areas of the Main Stem that were well into the high-70s/lo-80s this past summer. 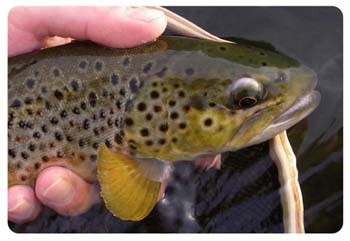 Over the weekend a short late-afternoon Lehigh outing offered up some pretty good fishing. Right off the bat the smallies were slamming a weighted woolly bugger. Some hit right at the fly hit the water, others hit at the end of the drift. None of the fish were too big - - 12" or so, but they were full of fight, and appeared to be very healthy. About this same time, there were some isos and yellow mayflies - - prolly the summer sulphurs beginning to pop here and there. Some fish also began to take notice. Saw a nice splash in the main current, and a quickly placed iso produced a vicious strike, but the fish did not stick. A quick move to another heavy run, produced some slowish fishing at first, and we were debating if we made a bad decision. Anyway, about 6pm the mayflies started to really hatch. And a few fish here and there started to rise. A heavy rise and an accurately placed iso, produced the first brown of the evening. At first it appeared to be a really large fall fish, but nope, it was a brown. This fish showed no signs of fatigue. Full on healthy and zipped line out. Fought great! Impressive. 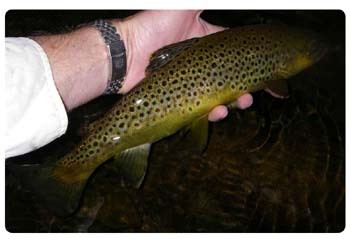 Soon there after, three more browns came to net. Only one of which you could definitely tell was a grown up stockie. Pectoral fin was a little beat up. All fish though were fat, and had been feeding well. I would not say though that there were a lot of risers for the amount of bugs though, but the trout are definitely there. Even had some rising fish, heavy rises that would not eat an imitation. Multiple fly changes, and no dice. Honestly, some of the trout landed, rose like chubs. Sloppy rises. Water was 68F during the entire outing. Not and bad evening on the Big Lehigh. Slow fishing on the West Branch and Upper D! Overall there was a lack of bugs though the entire weekend, and the color on the West Branch was not the best. 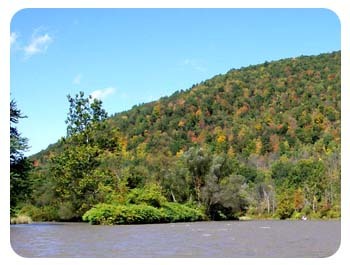 On Friday, the color was very bad due to a large slug of very cold water that was needed to satisfy the Montague target since Wallenpaupack was not generating. Not only was the water muddy on Friday, it had a lot of suspended weed in it. As the weekend wore on, the clarity on the West Branch did improve some, but really the visibility only ever did get to a couple of feet. With this being the case, along with the lack of bugs, streamers were the name of the game. While we did move quite a few fish over the course of a couple of days of fishing, we only landed one smaller fish. Some of the fish moved were bigguns, but as the case seems to be lately, they just were not that committed in eating. Following and swirling on the fly was the norm. As far as the main stem goes. A brief stop at Stockport provided very little action. Blind fishing an iso in the riffs yielded no results, and no bugs were observed. The water had that Penns Creek limestone green tint to it. Which might be a good thing on Penns, but not so that look is good for the Upper D.